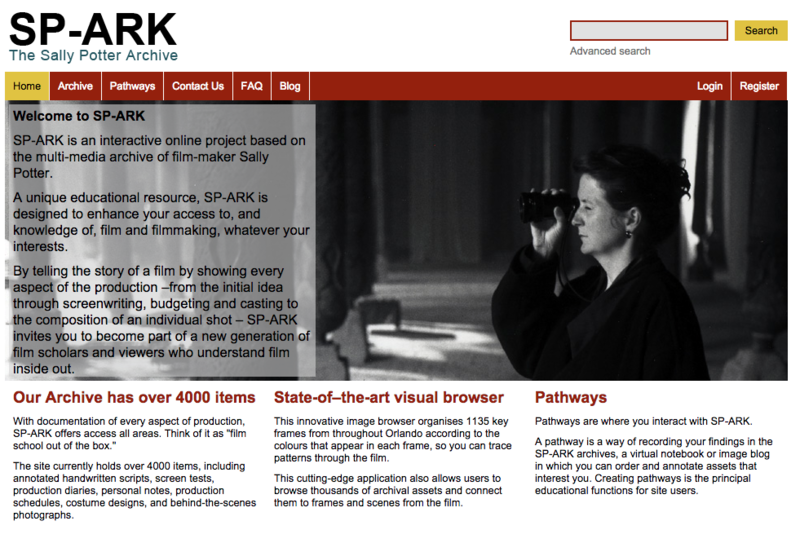 The SP-ARK project is an online education resource based on the working archive of Sally Potter, one of the UK’s foremost film directors. This extensive, unpublished archive relates to all aspects of Potter’s career as a writer, director, choreographer and composer. Its unique content ranges from annotated scripts, screen tests and production diaries, to personal notes, production schedules, budgets and behind-the-scenes photographs. SP-ARK is pioneering an entirely new approach to the use of archive material as an educational resource. It is unique in allowing students, scholars and film fans to interact, not just with its database of thousands of digitised materials relating to every aspect of filmmaking, but also with each other, offering chance encounters with other users in a global online community who may share similar interests – and the opportunity to dialogue with them via a dedicated instant messaging system. The development of SP-ARK began with the goal of providing an A-Z of filmmaking via an online platform. But it soon became apparent that to be really successful in reaching a generation of students raised on online social networking, SP-ARK would have to allow users to interact in real time. The aim was to allow an online community to collaborate and share ideas, making SP-ARK an interactive education tool rather than just a passive archive of materials. The unique innovative aspect of SP-ARK is that it pulls together the ability of Web 2.0 to host and stream multimedia with its social networking capabilities, allowing users to tag and blog their way around the SP-ARK database, as well as commenting on blogs by other users, who could be senior academics, Potter’s collaborators, students or fans, from either the same college course or anywhere in the world. We are calling this unique kind of linked blogging a “pathway”, which allows users to attach notes to a series of objects chosen from the archives and then saved as thumbnails. The pathway also provides a unique assessment tool for students who can save them for submission to their tutors. There is now a working prototype of SP-ARK which is being trialled in its beta phase at a number of partner education institutes in the UK, including London University’s Goldsmiths College, Queen Mary University, London and Bucknell University, USA. The response from students and lecturers has been overwhelmingly positive and we are now working together to improve the design and usability of SP-ARK. Our goal with SP-ARK is to provide a radically new and revealing experience of a multi-media archive for the social-networking age, which in turn provides a working model for innovative teaching and research, in all disciplines and at every level of education. You are welcome to browse through the sample materials already available on the site, currently over 4000 items. If you would like to access SP-ARK’s unique interactive features and become a trial user participating in the testing and future development of this prototype then please email us at beta@sp-ark.org with some information about yourself and your interest in SP-ARK. We will send you a username and password.